Exciting times are inbound, as I’m sure anyone looking forward to the new edition of Warhammer 40k will agree! I’m particularly excited as my degree course finally came to a close on Friday – I’ve been doing a part time course through the Open University since February 2012, and it’s with a huge sigh of relief that I had my final exam on the 2nd! 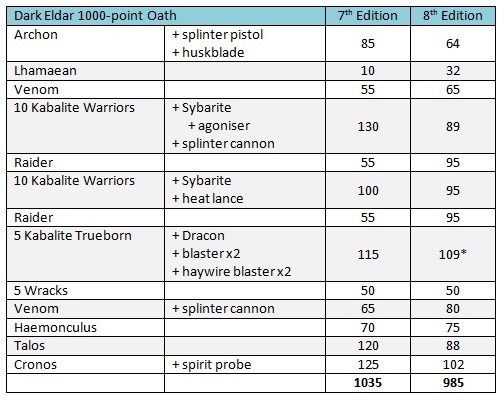 With no more essays or revision to take up my time, then, I’ve been applying myself with gusto to the task of completing the 1000-point list of Dark Eldar that I’d started work on earlier this year! At the weekend, however, I thought it’d be interesting to see how my list holds up in the new 8th Edition ruleset. The first thing that I can see is just how cheap it is for the same list this time around! I think the biggest factor here is the Talos, which has dropped by 32 points alone. Not having to pay for sergeant upgrades is also not insignificant! So these things have absorbed the increase in points that the vehicles represent, meaning that I’m overall 50 points cheaper! In my original list, I hadn’t upgraded the Trueborn beyond giving them a Dracon, but since I’ve now built them with 50 points-worth of upgrades, I’ve adjusted the Warriors accordingly. So I was a little over the 1000 points limit agreed by my local GW, but in 8th Edition, Trueborn can’t take haywire blasters, so having modeled them with these things, I’m feeling a bit bummed right now! I’m still in something of a planning stage with them, but I might make them counts-as dark lances, which they can take. Or just build two more with regular blasters and wait for 9th Edition! I was actually surprised to find that they’d made these changes, though – while obviously it’s a new edition, and things change, I somehow wasn’t expecting to see wargear options diminish like this. I’ve never been around for a change of edition, however – getting into 40k shortly after 7th Edition landed – so I suppose I don’t know what to have expected! Anyway, I’ve been making decent progress with my army lately, I think, so it’s time for a showcase! I’m really pleased with how this project has been going so far! Considering I wasn’t really sure what I was doing when I painted up my first Kabalite squad, I think it’s really gathered some steam over the last month or so, as I’ve managed to finish off the first batch of Wyches, churn out another batch of Kabalite Warriors, some Kabalite Trueborn, an Archon, a handful of more Kabalite Warriors, and most recently, two horrors from the Coven! My Wracks just need their bases finishing off, and they’ll be done as well! I’ve already started work on a Succubus and Lhamaean, while also trying to get started with the vehicles! I’ve not been entirely sure what I’m doing with these things – they’re probably the biggest miniatures I’ve tackled so far, with some very flat surfaces! I’ve been doing some drybrushing on them, the same scheme as with the Kabalite Warriors, though so far it’s only looking decent on the Venoms… Still, got to start somewhere! So, all in all, I’m really very pleased with these guys!! Pingback: Warhammer 40k 8th Edition – one week to go!